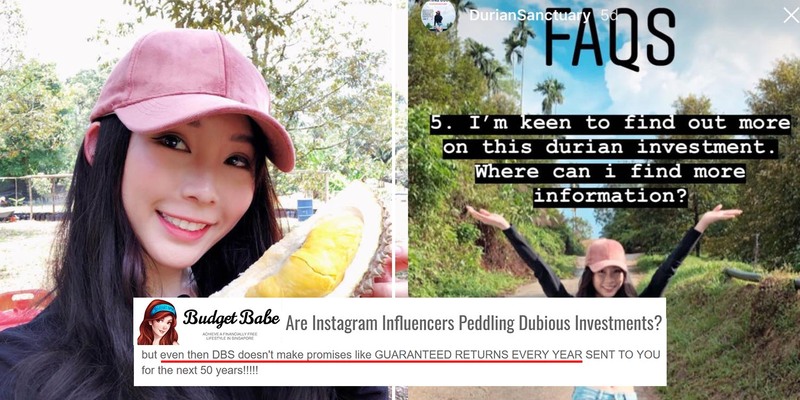 What do durians and influencers have in common? We can’t stop talking about them. 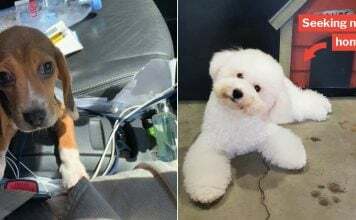 Popular Singaporean influencer Rachell Tan doesn’t only advertise for make up brands or clothing labels. 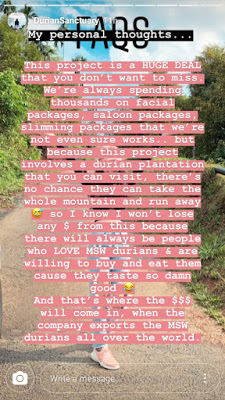 She has also been into investing in durian farms these days. The perks are no longer ‘quote PXDKITTY for 10% off’ or ‘free shipping for orders above $100’, we’re talking about ‘small investment with long term steady returns’. 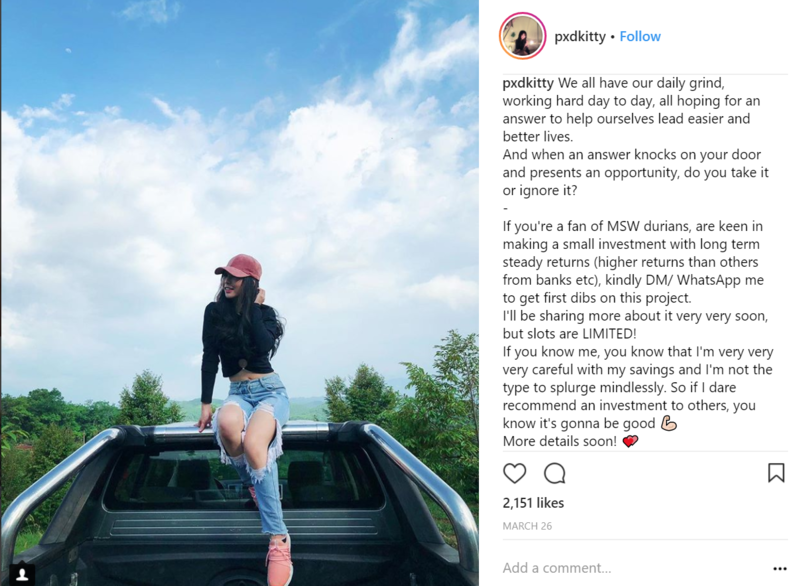 Never thought you’d be seeing influencers peddling investment opportunities? Well, this may be just the first wave. Full-time influencer, part-time financial advisor? 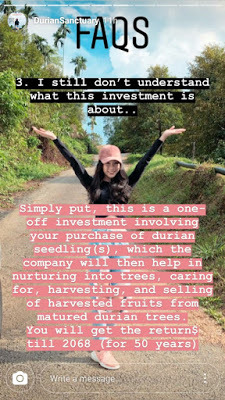 Rachell first broached the subject of investing in a durian plantation through an Instagram post. 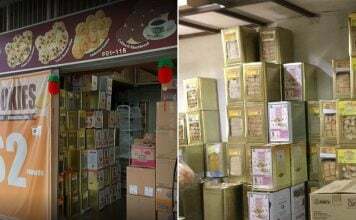 Then he’ll ask, “what do good guys sell (好人是卖什么的)?”, and I’d always say “good guys sell durians (好人是卖榴莲的)”. Which is why this project means so much to me. A few days later, Rachell then uploaded this video of her touring the plantation site, which also features the plantation owner. She then created an Instagram highlights reel titled Durian Sanctuary, where she addressed frequently asked questions about this investment opportunity. Rachell clarifies that she is not the boss. Her father happens to be the consultant managing this project, and she is helping him with emails. 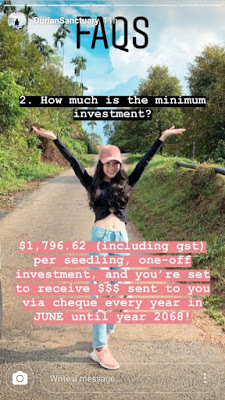 According to Rachell, the one-time-payment minimum investment sum is $1,796.62 inclusive of GST per seedling. The returns would keep coming in via cheque every year until June 2068. The person who makes payment is now the owner of the tree, and the plantation does all the housekeeping and harvesting for you. The company is planting 20,000 seedlings, but only 10,000 seedlings are available to public investors. The expected returns amount to approximately $44,000 per seedling. As durians don’t magically appear once the seed is planted, there is a remuneration plan for the first 5 years before the tree hits maturity. Afterwards, a portion of the earnings from each tree’s harvest will be credited back to its owner. She plunges into a narrative on how this is an opportunity that one shouldn’t miss out on, and that one can’t possibly abscond with the money since they can’t ‘take the whole mountain and run away’. 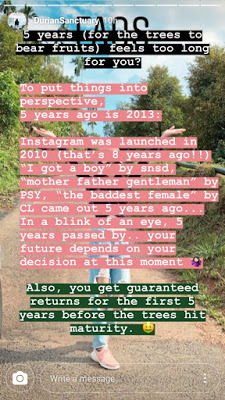 In an attempt to convince prospective investors that 5 years isn’t a long time, she draws parallels to Instagram’s launch date and how old various popular K-pop songs are. 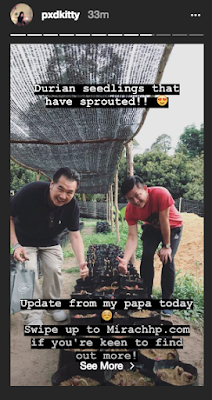 She includes pictures of the plantation, showing some durian seedlings that have sprouted. 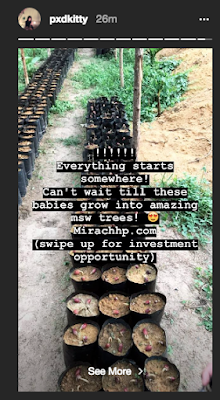 As proof that this operation is on the runway to success, she attaches pictures of the some seedlings that have already sprouted. In one of her posts, Rachell is so confident in this project that she calls this her ‘retirement plan’ which will allow her to retire before turning 35 to ‘enjoy life’. Sounds like the deal is ‘too good to be true’? Well, your gut feeling is probably right. 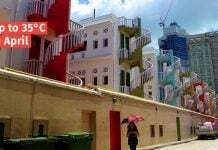 SGBudgetBabe highlighted some clauses in the contract which should get your alarm bells ringing. 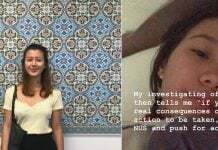 We condensed her lengthy blogpost into 3 points. 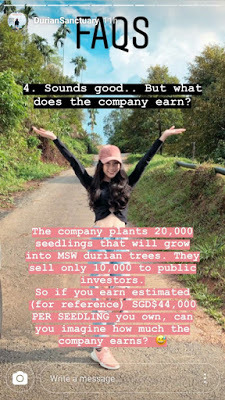 Rachell separately promises a guaranteed return, getting returns until 2068 (50 years) and mentions earnings of approximately $44,000 per seedling. This might mislead some into thinking that the guaranteed returns clause promises an average of $44,000 across 50 years. The above two sentences have way different meanings. But what she fails to bring up is that this guaranteed return does not refer explicitly to the $44,000. Instead, it’s referring to the pre-maturity payment plan, which ensures that an amount of 250RM to 400RM is being paid out per year to the owner from 2019 to 2023. The guaranteed returns clause expires at the end of the 2023 financial year. Not for 50 years, as many of us might hastily conclude. 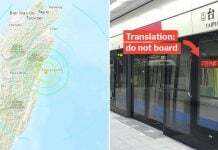 The company is registered under Malaysia’s Labuan Companies Act 1990, and will be governed under Malaysia law. Singapore law, the one we are familiar with, is different from Malaysian law and may not offer the same protection one expects, should any conflict of interest arise. From, 2018 to 2022, should your seedling die, the vendor would bear the full cost and replant the equal number of seedlings affected. However, from 2023, should any unfortunate event result in the demise of the durian trees, the cost of replanting an equal number of trees is to be deducted from the owner’s total harvest returns. Lightning strikes, freak storms, and the like — make sure you account for all these risks before diving in. Apart from the above two clauses, like most contracts, the company would not be held liable for any losses or damages due to uncontrollable factors in the next 50 years. So do peruse the contract closely before signing on the dotted line. 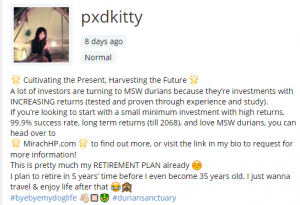 We followed the link in her bio to Durian Sanctuary’s website, Mirach HP Limited. Tracing the address listed on the website leads us to the office for Mirach Energy Limited. Strange that a company categorised under offshore oil field and product engineering services is managing a durian plantation. Nothing illegal though, a company is entitled to have their own a spin-off projects. 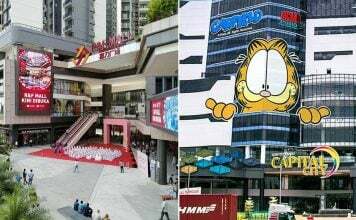 However, considering this investment venture is not officially recognised under Singapore yet, make sure to consider all risks before diving in. We aren’t insinuating that Rachell’s promoting a scam, perhaps she is genuine about sharing this chance to strike a fortune. Yet it always helps to be cautious and critical of where you park your money. You can’t trust everything you see on the internet – or in person, for that matter – regardless of who or what promotes them. After all, like what BudgetBabe’s hinting at, if it sounds too good to be true, it’s probably not. 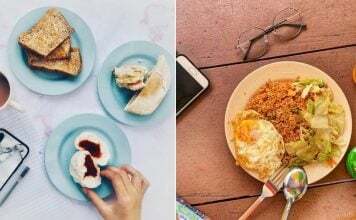 Featured image from Instagram and Instagram.